• Includes an integral finger grip to aid movement of magazine file in confined spaces. • Moulded in highly robust material. This CEP Pro Gloss magazine file is made from recyclable, shock resistant polystyrene with an elegant contrasting matte and gloss finish. The file can hold documents up to 240 x 320mm in size and can be used vertically or horizontally for versatile desktop use. Great for storing magazines, catalogues, brochures and other documents, the file also features a convenient handle for easy removal from a shelf, and a low 20mm front for easy access to contents. 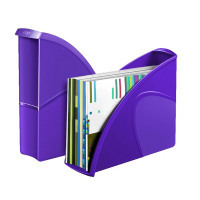 This pack contains 1 purple magazine file measuring W85 x D270 x H310mm.